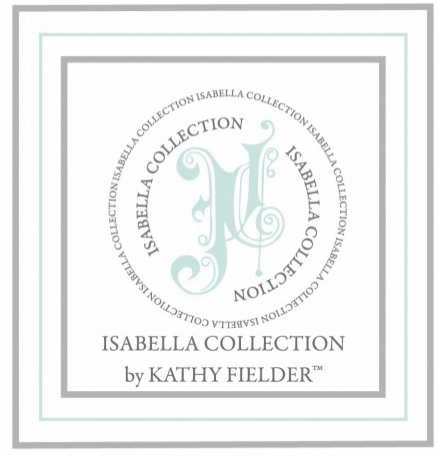 Isabella Collection by Kathy Fielder has just debuted three stunning new designs for winter/spring 2019. The collections embody style and glamour, while still being livable and beautiful, truly evoking KF’s aesthetic. We asked Kathy for some of her design inspo while creating / designing them, and her advice on must-have color schemes for your bedroom this winter/spring 2019. The blush-hued, Asian inspired textile of the Jasmine bed epitomizes refinement. Subtle colors of soft pink, grey, and cream completely modernize the Asian feel of this oh-so chic collection. Paired with our plush Lyssa coverlet set and styled with a grey finely crafted faux fur European sham and throw pillow, it’s finished off with a gorgeously lush faux fur throw. This collection has a luxe hand and look that speaks to it’s bespoke design. Fine details like the ivory shell pillow, edged with delicate beading, Jasmine is designer bedding at its finest. Kathy feels that a beautiful room starts with beautiful textiles. Her passion in this collection is the gorgeous refinement of the patterns and soft and inviting use of color. While seemingly a bit more feminine with it’s blush coloring, it has a classic and beautiful appeal to soften any space. KF Tip ~ When going with a striking combo such as this, choose soft grey or taupe walls that make your space cohesive and inviting. Accessorize with creams and greys, along with soft metallics with modern-day inspiration for a designer look and feel in your space. Chic, timeless and elegant are a few words to describe Francois. Metallic gold motifs with a high french flair embossed on cream linen creates an eye-catching and strikingly fashionable collection. The gold toned faux fur European sham and throw, add an extra layer of luxury and extravagance making this bed fit for the person who loves the finer things in life. Modern and clean, beaded and metallic throw pillows top off the classic Francois with a modernized touch and are statement pieces on their own. Kathy was inspired by a modern day Marie Antoinette vibe when creating this collection. Passionate about classic patterns accented with modern touches, she wanted to create the perfect luxury bedroom getaway. KF Tip ~ Modern day glamour is such a striking combination. Gorgeous fabrics work volumes in creating a luxe space. When choosing a paint color for a gold and cream combo, you have so many wall color options. Want something feminine and light, choose a beautiful blush. A soft, grayish taupe keeps the neutral, yet inviting feel. Want dark and saturated, a gorgeous navy is regal and refined and provides the perfect contrast for the bedding to really pop. 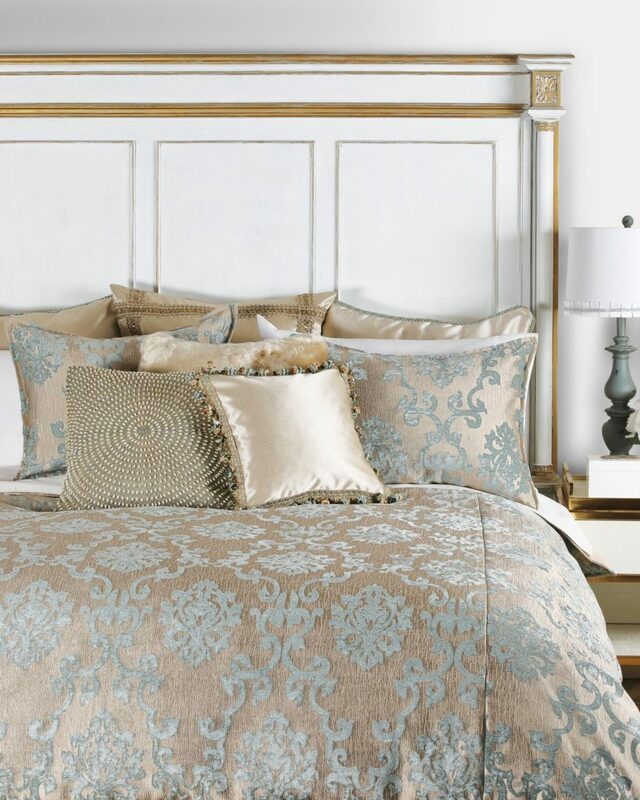 Gold and blue are so striking together, as seen in the classic Sabrina collection. A lush and livable color combo, it makes for a notable pair that you want to dive right into at the end of the day. Simple champagne accents with a mixture of textiles and trim add a level of opulence that make this traditional design feel current and new. The addition of a beaded and faux fur throw pillow paired with the tasseled satin pillow adds different layers of texture that KF is known for perfecting in her designs. Kathy’s ability to mix the unexpected to create something beautiful and timeless is one of the traits she is most known for, and she advises keep your accents and art classic and timeless with this look. 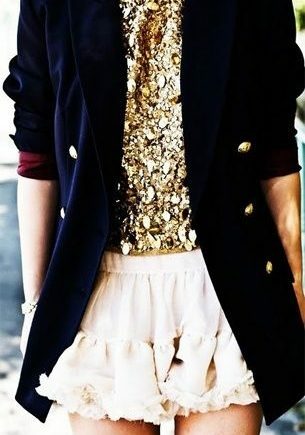 Gorgeous gold metallics are the perfect finishing touch. Blown glass lamps are another perfect accent with this collection. KF Tip ~ A beautiful blue wall color will make this classically refined palette that much more stunning. Soft blue is an incredibly calming and classic wall color. It gives so much depth and dimension to a space. Blues can be a little more tricky to select, so make sure and get some samples and select the correct undertone. Check out more on selecting the right paint here. Many readers may not know that while Kathy is a blogger and influencer, she is also the owner, designer and manufacturer of a textile company. 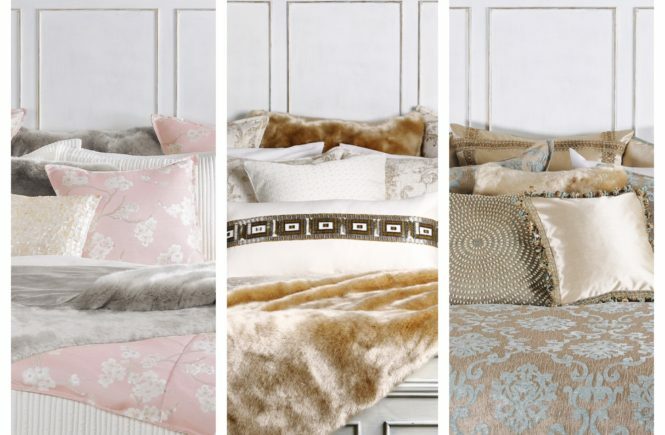 Isabella Collection is a luxe line that features everything from bedding to pillows to window treatments and more. This company is near and dear to our EIC’s heart for many reasons. But the biggest is its name, Isabella, for Kathy’s 15 year old daughter. With Kathy’s mom, Mary, being the head pattern-maker, everything her company does has family at the center of it much like Kathy, who’s number one love and priority is her family. Along with being a family orientated company, Kathy Fielder Design | Life | Style works to empower women. Through her female family members and female employees, women are at forefront of Isabella Collection by Kathy Fielder. You can see more here.